Summary: (from the back of the book): Pedro Zamora changed lives. When the HIV-positive AIDS educator appeared on MTV's The REal World: San Francisco, he taught millions of viewers about being gay and living with AIDS. Pedro's roommate on the show was Judd Winick, a cartoonist from Long Island. They soon became close friends. Judd created Pedro and Me, a book in words and pictures, to honor Pedro Zamora, his friend and teacher, and most of all, an unforgettable human being. 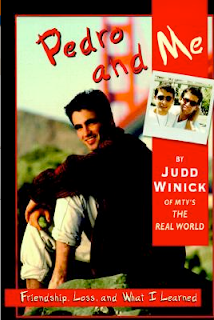 Review: I remember watching the third season of MTV's The Real World: San Francisco and being really into it. No other season after that (and I'll admit I only watched other seasons intermittently) seems to have been as real and honest. In 1994 HIV and AIDS were still new to most of mainstream America and the show managed to educate a generation of young people about the disease, how to behave, how to ask questions, and how to stand up for oneself in the face of intimate awkwardness (does that make sense?). As the book points out, when Pedro died people around the world finally felt connected to the disease in a way that, perhaps, they hadn't before. Winick gives a good amount of background about the show, the process of becoming a housemate, his childhood, Pedro's childhood (what a contrast) and then it gets into the Real World time and Judd and Pedro's friendship. He puts all his own fears about living with a roommate who is HIV positive out there, shows his initial ignorance about the disease, and in that way, this book is educational as well as a really good story. I also remember really liking Winick's artwork when I watched that season of The Real World and I was reminded of that as I read this book. His style is to draw very realistic characters; I can recognize them from the show and it's been 15 years! This book is poignant, funny, interesting, and emotional. I loved this book when I read it a few months ago! I haven't read this book, but I like how it sounds! Great review! Never watched the real world. I'm too young to have seen this season live anyway, but I have heard about this book. It sounds really good. I'm glad it's out there and I'd love to check it out at some point. Great review. This was probably my favorite season of the show and I really looked up to Pedro. I will have to check this book out. I absolutely need to read this! It sounds so sad, but so important too.